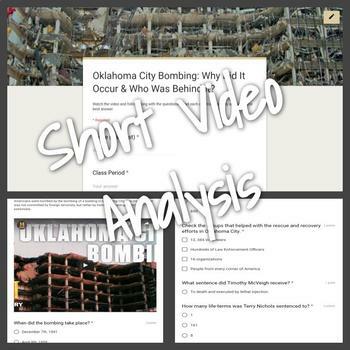 This product is a Google form with a short video on the Oklahoma City bombing. The video (5 min:09 sec) is inserted into the Form. The students will follow along with the video and answer the 9 questions on the form. This is an enrichment activity or excellent homework assignment. They can do this from their phones. 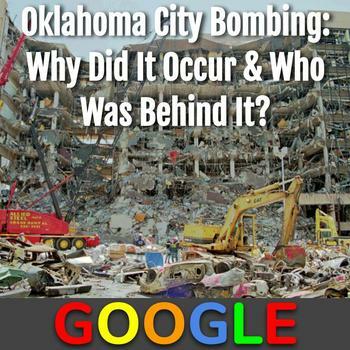 The Oklahoma City bombing occurred when a truck packed with explosives was detonated on April 19, 1995, outside the Alfred P. Murrah Federal Building in Oklahoma City, Oklahoma, leaving 168 people dead and hundreds more injured. The blast was set off by anti-government militant Timothy McVeigh, who in 2001 was executed for his crimes. His co-conspirator Terry Nichols was sentenced to life in prison. Until September 11, 2001, the Oklahoma City bombing was the worst terrorist attack to take place on U.S. soil.